How many heartbeats are there in a lifetime? This is College Physics Answers with Shaun Dychko. 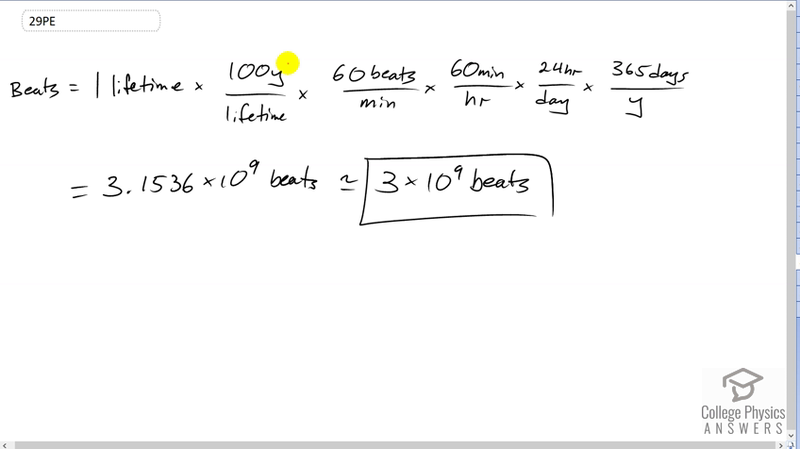 To estimate the number of heartbeats someone will have in a lifetime, we have to make some assumptions, and we have to assume that they will live for 100 years suppose, and that the heart rate during the time alive will be 60 beats per minute. And then... And then otherwise, this question involves a lot of conversion. We have to convert this time unit of minutes into years so that it cancels with the 100 years there. And we do that by multiplying by 60 minutes per hour, and then multiply by 24 hours per day, and then multiply by 365 days per year. And technically, there's 365.25 days per year because it's a leap year every four years so that quarter of a day happens each year, but you know, we're dealing with approximations here. So, there's no sense trying to be super precise in any of these numbers because these numbers are definitely not precise. And this works out to 3.1536 times the end of the 9 beats. Now, this can't be precise because our assumptions are not precise. And so, we'll round this to one significant figure of 3 times 10 to the 9 beats. So, that's 3 billion heartbeats in one lifetime. And if you get a different answer, well, that's to be expected because you might make different reasonable assumptions about the lifetime and the heart rate. And so, anything of the same order of magnitude would be fine. And by order of magnitude, I mean anything multiplied by 10 to the 9 or even multiplied by 10 to the 8 would be reasonable. Hi raffielliemarley, that's a fair question. Currently I'm accelerating coverage of more chapters by doing only the odds the first time through. After covering odds in every chapter I'll probably do all the evens, depending on survey results (https://www.surveymonkey.com/r/N5WX87Y) from students.